No library can possibly have every book or article, and when you are doing research there are times where you need something that the UCF library just doesn’t have. This is when you need to call in the experts at the Interlibrary Loan (ILL) office. Libraries call this resource sharing, a way for libraries to make their resources available to each other in an efficient way. Where do I go to make an ILL request? Go to the Borrowing from Other Libraries webpage. There is a video introduction to the ILLiad software showing you how to make a request. Don’t wait until the last minute to make your resource list for a project or paper. Interlibrary loan can take from 7-10 business days for a book (depending on where we get it from – it could be from Florida or from California). So, request your books early! Articles are sent electronically within 3-5 business days typically. So, request your articles early! While it seems like a good idea to interlibrary loan textbooks, most often other libraries will not lend them. Academic libraries generally keep textbooks on reserve for their own students and don’t share with other libraries. So, please keep this in mind. We always try our best, but we are not miracle workers. That means that we can’t always fill your requests . Out of 16,000 requests from all of you last year, we filled 90% of them. Those are amazing stats, by the way. Next time you check out an Interlibrary Loan (ILL) book, you may notice that it now comes with a brand new, reusable UCF book strap around the cover. From now on, books that we borrow from other libraries’ collections are getting dressed up with these straps in order to help protect and preserve their covers as our own students, faculty and staff use them. In other words, adhesive labels are out – and book straps are in! In order to comply with a new policy to better preserve ILL materials, book straps must now be used in lieu of adhesive labels. Our reusable book straps are a ‘greener’ option because they eliminate the need to create paper straps for each book, which not only reduces paper usage, but also gives our staff more time to find those items you need! Going forward, new paper labels are being designed to fit inside each book strap pocket, which will help cut the cost by decreasing our usage of the pricier adhesive labels. If the next ILL book you pick up comes with one of our new book straps, please avoid removing it, and make sure to return it along with the book. In the future, a replacement fee may apply for any book straps that are not returned. As a friendly reminder, all ILL items may be returned to the library book drop, Circulation Desk or directly to the ILL Office located in the John C. Hitt Library. What do Amsterdam, New Zealand and South Africa all have in common? They’re all places where books from the UCF Libraries collection have recently traveled to via Interlibrary Loan! UCF takes pride in being an international lender to help fill the academic research needs of foreign libraries. In fact, there are currently 312 international institutions that are registered to request UCF materials through Interlibrary Loan. 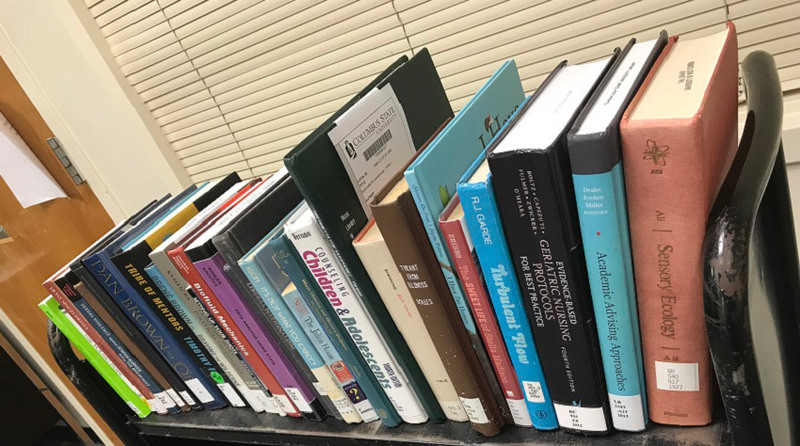 In the past year alone, Interlibrary Loan has filled over 100 requests from international borrowers, some of which pay large shipping costs to obtain valued UCF materials. So, the next time you find yourself perusing a book from the library stacks, remember that it may have traveled far and wide, across the world and back again, to be in your hands now. Can’t find what you’re looking for in the UCF Libraries? Submit your own Interlibrary Loan request for a book, book chapter, journal article & more, by visiting the Borrowing from Other Libraries page on the UCF Libraries website.